Harry Stuhldreher, Elmer Layden, Don Miller, and Jim Crowley were four standout football players at Notre Dame, who led the team to an undefeated season and to the 1924 National Championship. In 1955, Topps placed all four athletes on the same card to honor their legendary status. This 1955 Topps All-American Four Horsemen card is very popular among collectors as is the entire set. 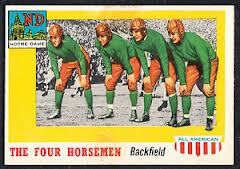 As a favorite of collectors, the 1955 Topps All-American Four Horsemen is a great card to own, and one that can double as an excellent investment now that Notre Dame is once again back among the national championship contenders. The 1955 Topps All-American set featured great collegiate players from the past and remains highly popular because of its design and the fact that it's part of a smaller set that's attainable. In 2011, an example of this card graded at PSA 9 sold for almost $4,500 at auction. However, fewer than 20 examples of the '55 Topps Four Horsemen have received that grade, so cards at that level usually attract attention. Lower grade examples are also valuable. Those graded at PSA 7 often sell for $400-$500, and those graded at PSA 6 usually sell for less than $300. Condition, which contributes to scarcity, is a major factor in determining the price of these cards. The constant desire for this unique card will likely mean it maintains and perhaps grows its value long term, which will translate to profits for anyone who wisely chooses to invest in a 1955 Topps All-American Four Horsemen. Purchase at the highest level you can afford after comparing recent sales of identically graded cards to ensure you're buying at a value level.